Much of the work of City First is accomplished in partnership with non-profit developers. 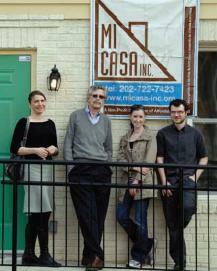 One such example is the financing we provided for Mi Casa to support its new initiative in Ivy City. Founded in 1992, Mi Casa Inc. is a nationally recognized, locally based non-profit organization whose mission is to provide affordable home ownership, in particular well-designed, energy-efficient homes for families of low or moderate income. Mi Casa is also committed to maintaining neighborhood open spaces and community multi-use and service areas for existing populations. Mi Casa recruits minority contractors to join revitalization efforts, and supports small businesses by creating jobs within District of Columbia communities. In a joint effort between the District, residents, and non-profit developers to restore the Ivy City neighborhood in NE, Mi Casa was awarded several vacant lots by the Department of Housing and Community Development (DHCD) for construction of for-sale affordable single family homes. Mi Casa completed the first phase of the project, which involved a green renovation of three existing buildings into eight condominiums affordable for low- to moderate-income families. For the second phase, City First provided $1.15 million in acquisition and construction financing that assisted Mi Casa with the construction of seven highly energy-efficient single family homes in nine scattered in-fill lots in the neighborhood. The homes will be available to families earning 80 percent of the Washington Area Median Income.